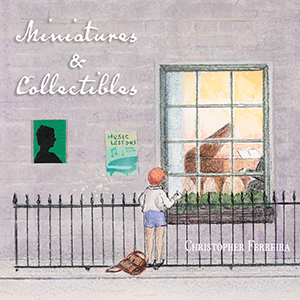 Miniatures and Collectibles, is a collection of 21 little pieces written by some of history’s greatest composers, reimagined and brought to life. The journey began when I started playing piano accompaniment for a children’s Eurythmy class at the Waldorf school several years ago. In my search for music to include in the program, I discovered many little gems, old pieces that reminded me that music is alive and needn’t be long or complicated to express great feeling or ideas. Some of the pieces in this collection will be well known to student pianists as early repertoire. Others have been largely forgotten by history. I was inspired to bring these pieces to life and give my own artistic expression to them. This is how the album was born. Please enjoy full length samples from the album in the Store. All songs produced and performed by Christopher Ferreira. Songs 13,15,16 and 19 arranged by Christopher Ferreira. Recorded at Skywalker Sound, Nicasio, California on May 30th and June 15th 2018 . Miniatures and Collectibles © 2019. All rights reserved. This recording is dedicated to my mom, Michael Ann Ferreira, who has never stopped believing in and supporting me. A special thank you to Atsuko Yamagishi, who contributed so much to this project. Her love, support, and feedback made this album possible. I also thank my sister, Charity Ferreira who generously helped with so many things; the Goorjian family for their endless support and encouragement; Richard Rogers for his sage musical guidance; Valerie Collins for the beautiful artwork; Kenji Hayashi and his family for everything (especially the feasts! ); The Yamagishi family; Berkeley Rose Waldorf School; Barbara Marcotte; Gabriel Shepard; and everyone who supported the development and completion of this album. Finally, I offer this album in loving memory of those I wish I could have shared it with but who are no longer with us, including Ronald Ferreira, Miyoko Yamagishi, Jerry and Cynthia Wyman, and Adam Twain. “Twilight” © Zen-on Music Ltd.; “Ivan Sings” © G. Schirmer, Inc.; “Night Mood” © Universal MCA; “Evening in the Meadow” © Alfred Pub Co Inc.; “Noel” © SDRM.